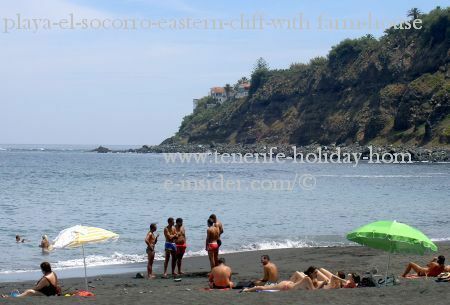 Is Playa El Socorro different from other Tenerife beaches? 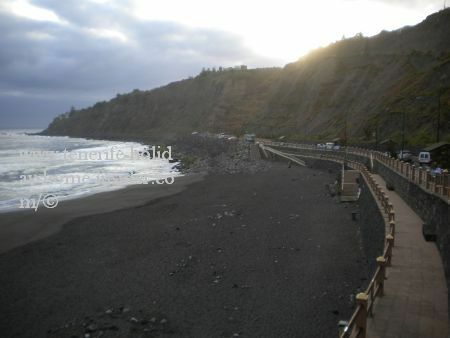 The most awesome time to get to know Playa El Socorro of Los Realejos is at sunrise. We went there in June by 7.30 in the morning. 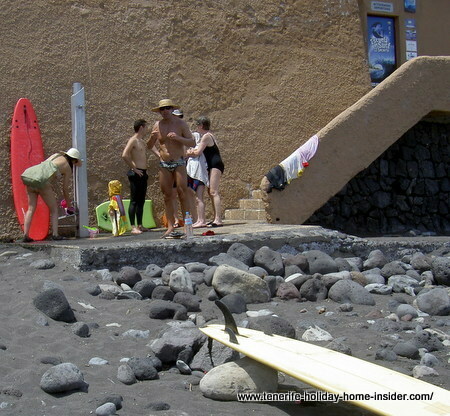 Then, serious sports people of the region come to work out and to surf and swim. Two elderly Scandinavian expatriate ladies were the exception. 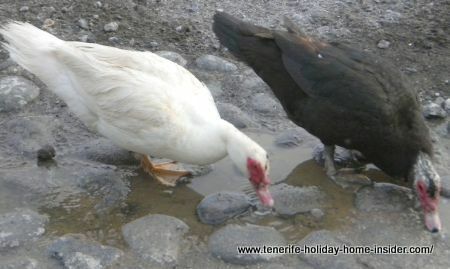 They finished their wake-up splash in the Atlantic and left the beach when we arrived. In fact, in June 'Soft Gym' free early morning group exercise was introduced on the beach for all ages from 7.30-8.30 on Mondays, Tuesdays and Thursdays. It has been extended until the end of September so far. Look out for the guy with a red board and a paddle... You will spot him eventually by the best swell. All other surfers follow him but will keep out of his way on the waves. 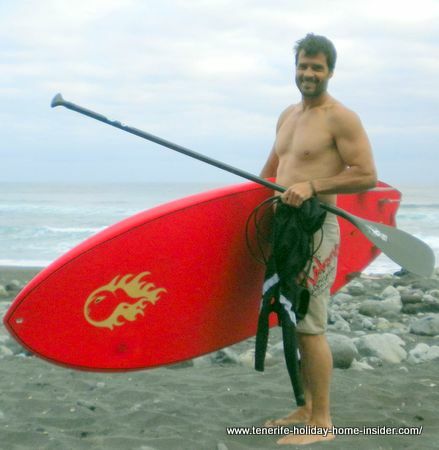 In fact, the friendly SUP surf expert of stand up paddle surfing didn't mind to have his photo taken. We would have asked his name, had we known then how good he was with his board and paddle. 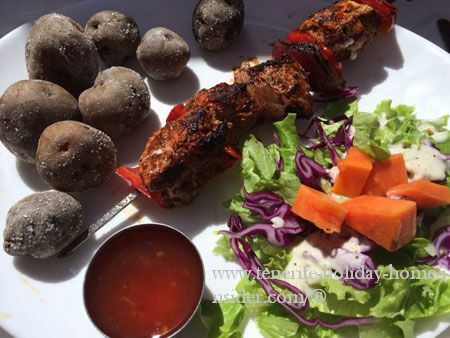 Unfortunately, we could not stay too long, as we had so much still on our agenda. 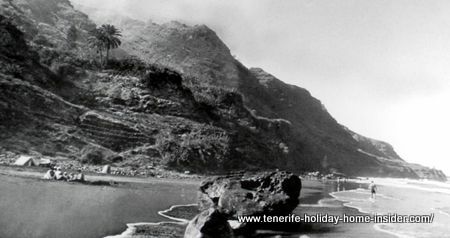 Only about 14 km from Puerto de la Cruz by the TF5. 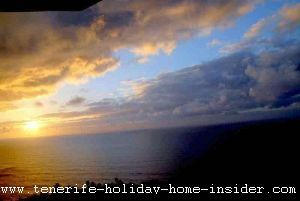 Outstanding Playa del Socorro sun downs over La Palma, above all in June. 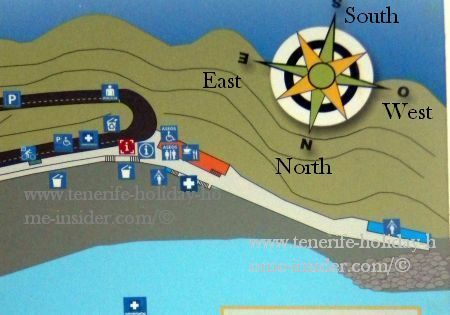 Much Tenerife hotel accommodation not far from the beach, while the luxury Apartments San Pedro by its look-out may be the closest. 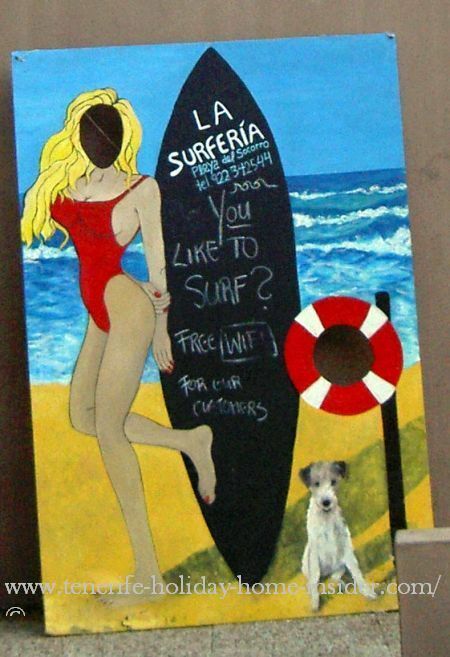 Look out for the charming La Surferia billboard for surf tuition by the bar restaurant with the same name..This eating place serves snacks and home made daily menus, such as also delicious. soups. They call them red, yellow, green, white and orange soups. 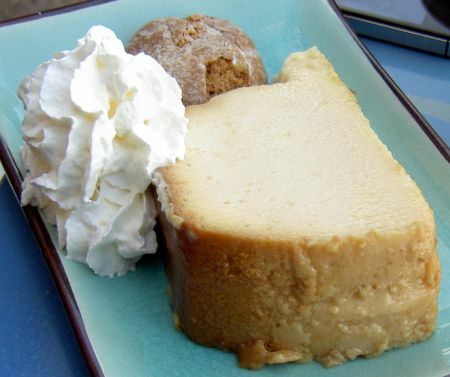 The latter is a pumpkin creme pottage. Featured are winter as well as summer scenes. Some were captured late in the afternoon, others over lunch time and the last by sun-up. 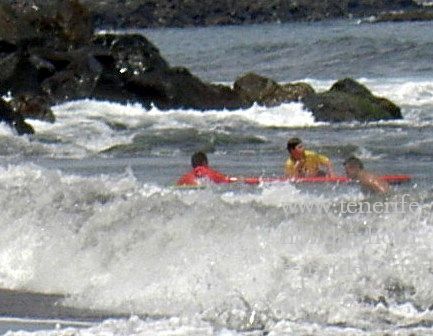 El Socorro surf coaching June 2013 on the beach West side. 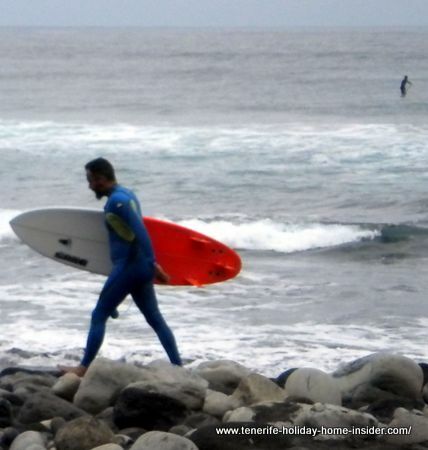 Interesting to know about Tenerife surf classes. 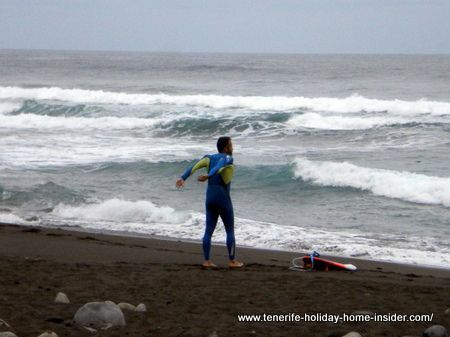 In 2013, we chatted to a young surfer on el Socorro beach. He spoke English well. He would have taught us the skills of surfing for a reasonable fee. Many young locals are well educated but are out of work and have time for coaching this watersport. More options may be at this Realejos surf school for young and old. 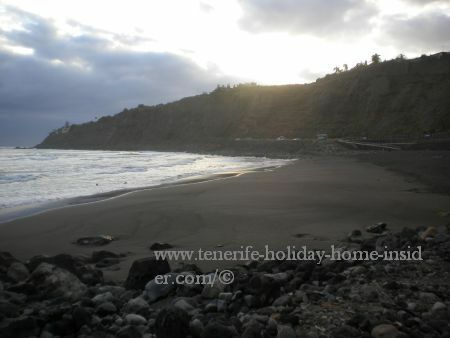 Playa del Socorro is not an ideal winter beach. 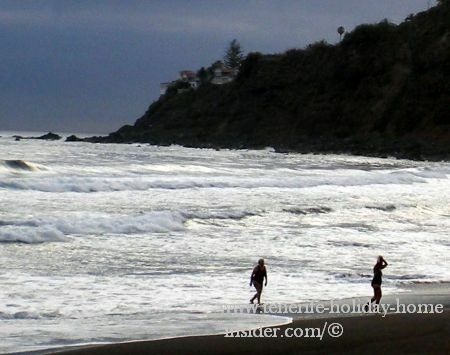 This is often the case with smaller West Coast shores of Los Realejos that are in a secluded spot. Also more pebbles seem to replace beach sand then and there may be algae backwash. 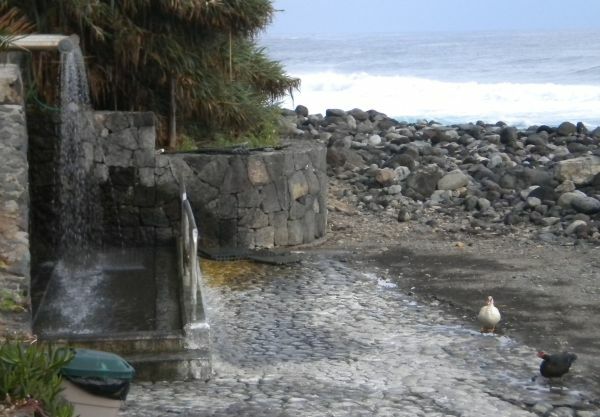 Puerto de la Cruz beach alternative suited for non- swimmers.